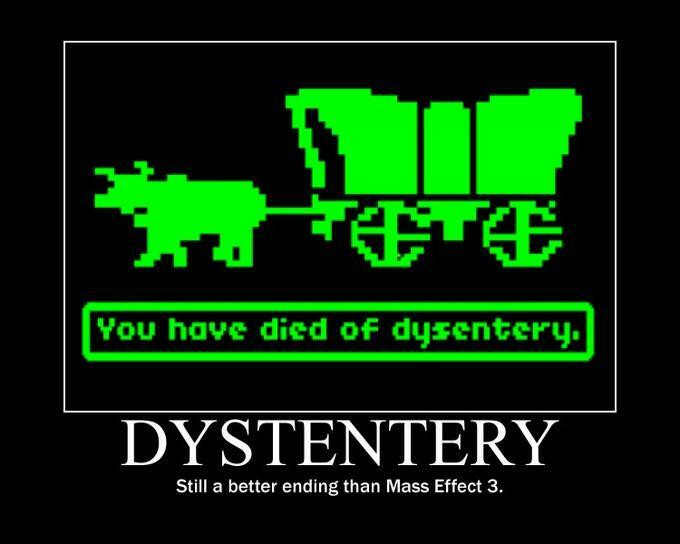 To say that the gaming community was somewhat disappointed in Mass Effect 3’s ending would be a sizable understatement. 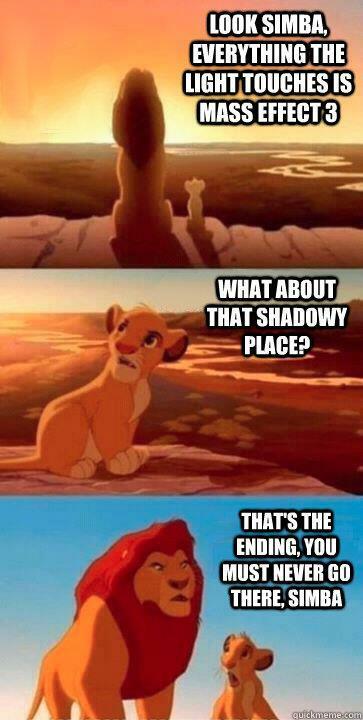 People HATED it with a passion normally reserved for Friedberg & Seltzer movies and serial rapists. Seriously, read this and see if you get anything more than “Wah wah. I made all these decisions and things didn’t turn out exactly the way I envisioned they would.” Welcome to existence, dude. The Mass Effects are the most intense games I’ve ever played. Sure, Skyrim was probably more epic. Various Calls of Duty and Battlefields are louder or have more explosions and background action. Mass Effect takes those more traditional elements of intensity and combines them with player investment. Mass Effect establishes a massive universe, an interesting story, and a bevy of potentially great characters. 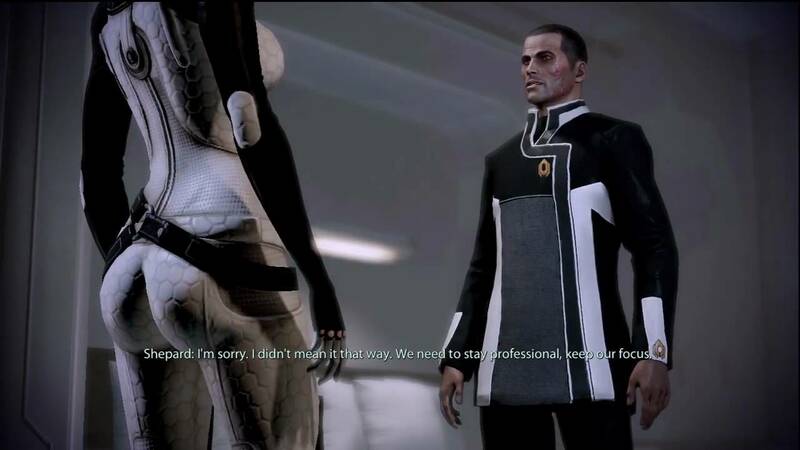 The characters take a game or two to flesh out, but overall, Mass Effect makes you give a crap about what you are doing because bad decisions have negative consequences on locations or characters you care about. That sort of investment pays dividends in missions like Feros and the Citadel, where pitched battles and climactic cutscenes (and inspirational speeches on Virmire) come together to make the player feel like they had just saved the universe themselves. Mass Effect 3 manages to top them all. The game’s designer’s noticeably increased the challenge of every difficulty level. I found myself fighting for my life more in 3 than I did in any other game in the series. Every step feels appropriately apocalyptic. The Reapers have harvested countless civilizations before and we are given little evidence to believe Shepard can prevent this one. On Pavalan, two Reapers crack a Turian frigate in half while the hulk of another lies beneath one of the behemoths. The Geth, the galaxy’s most advanced AI, are hacked. Shepard fails to complete an objective for like the first time in his life. So on and so forth. Hell, Earth falls within the game’s tutorial mission. Meanwhile, earnest, mournful motifs punctuate Mass Effect 3’s score, replacing the energy of Mass Effect and the bombast of Mass Effect 2. And of course, the game’s final mission features a battle between the Reapers and an inter-galactic armada, immediately followed by a somehow even more desperate ground offensive in London. You basically don’t breathe for the last several hours of the series. I’ve always believed that a story is only as good as its antagonist. Heroes are cool and all, but they serve no purpose unless they are faced with a legitimate threat. Weak bad guys kill a story’s suspense and leave us underwhelmed by the hero’s victory. Oh, you defeated The Goldfish? The supervillain who can’t remember his plan the next day? Great work. Luke Skywalker is nothing without a wheezing juggernaut to oppose him. The Borg gave us some of the best episodes in Star Trek history until Voyager ruined them. Gul Dukat elevated Deep Space Nine beyond its peers. Battlestar Galactica might have had killer robots, but the true enemy was our own nature – slow to forgive, adapt, and change. The Wire painted our true enemy as the system itself; the very institutions we created to maintain our society. A story is only as good as its antagonist. Mass Effect showed us two powerful villains before beautifully pulling the rug from underneath us. The first time we see Saren Arterius, he murders a fellow Spectre. Saren is aided and advised by Matriarch Benezia, possessor of centuries of wisdom, immense biotic power, and impractical attire. The entire first game is spent pursuing Saren and Benezia to stop them from handing the universe over to the Reapers. 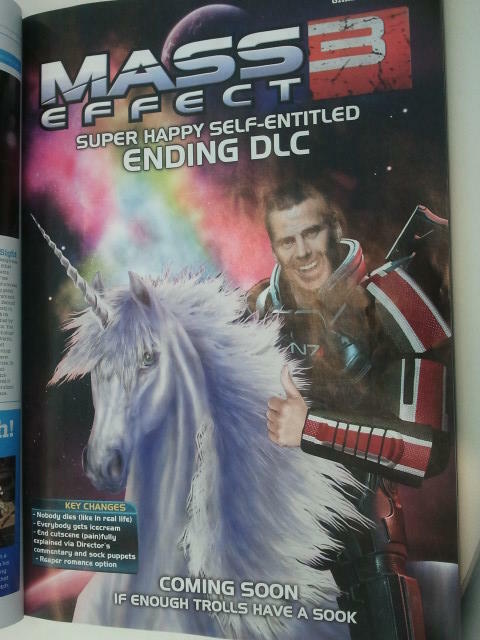 Even before you press a single button, it is clear that Mass Effect 3 is going to be very different from Mass Effect 2. Gone is the title screen’s stirring music. Gone is the grandiose idle menu cutscene full of action and danger. In its place is one of the most sober pieces of music imaginable. 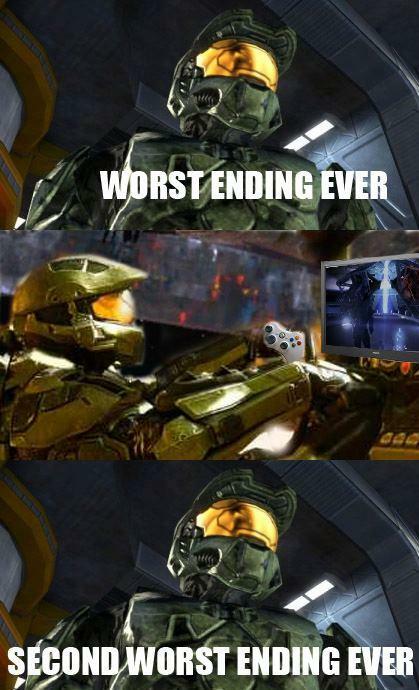 No cutscenes. No bombast. No firefights. Just a sad song playing while a planet burns and what seem to be meteorites burn up entering a planet’s atmosphere. Remember when I mentioned the major shift in music from Mass Effect to Mass Effect 2? Well, Mass Effect 3 switched it up again. Mass Effect had to establish a universe, set almost 200 years in the future, where humanity was the newcomer. We are galactic infants and the music needed to show some sense of wonder and possibility. Jack Wall and Sam Hulick succeeded in that regard with a score inspired by sci-fi electronics. Mass Effect 2 was all about assembling a superteam of badasses, a sort of a sci-fi Expendables, in order to save humanity from new threats and old. You recruit a who’s who of galactic experts to defeat the bad guys. That calls for some Hans Zimmer. I’ve probably overused the word “bombast” in relation to Mass Effect 2’s music, but it’s either the most accurate term or the most accurate in my limited vocabulary of music descriptions. In any case, Wall & Hulick again delivered the score ME2 needed. Mass Effect 2 is a better game than Mass Effect. After all 56 hours of gameplay Mass Effect 2 had to offer, that much was clear. Mass Effect 2 is sleeker. The graphics are better. Combat mechanics are more stable. You no longer have to tediously outfit your entire crew. The mini-games for hacking consoles and bypassing security feel more like hacking than Mass Effect’s “random series of buttons.” The storytelling is more personal, tightening the story and making it more engaging. Not only did Mass Effect 2 tell a better story; it told a bigger one. The Collectors, agents of the Reapers, are abducting tens of thousands of human colonists as… ummm… part of the Reapers’ plan somehow? Okay, maybe the story wasn’t as good as the storytelling, but it did feel that way.